Last weekend we took Garrett to see the Discover the Dinosaurs exhibit in downtown Birmingham. We also took a gander around the Home and Garden show at the BJCC. It was pouring rain when we left so we had to hold bags over our heads and make a run for it. Then we had to give Garrett the speech about how he should never, ever put a bag over his head again. Do as I say, not as I do and all that. Those tidbits are completely irrelevant to this story, but it makes a good segway to let you know why I was wandering around downtown taking pictures in the rain. Since I’m hardly ever downtown anymore I decided to take a detour to a few places around the city and snap some photos that I’ve been wanting to get for a while. Here is the Peanut Depot on Morris Avenue. It would have been better if that white truck had moved and I’d actually gotten the whole “Peanut” in the photo, but that’s ok! I still dig it. 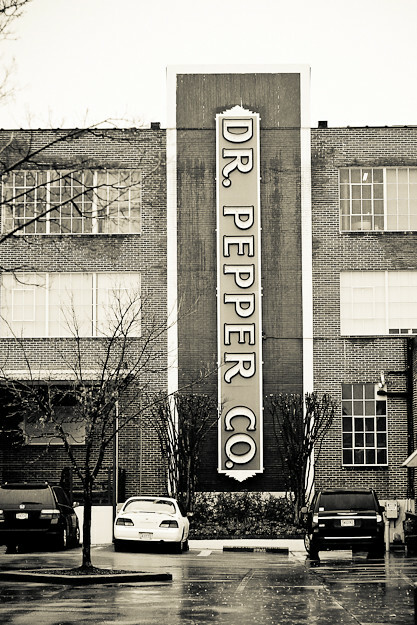 One of the pictures I specifically wanted was the huge Dr. Pepper sign at Pepper Place. When I was 19 years old I worked for a commercial furniture rep at Pepper Place, so this building has special memories for me. On my lunch breaks I would wander over to Richard Tubb Interiors and oogle at the prices of the giant armoires that were lined up in the hallway next to the Coke machine. I also loved perusing through the Interiors Market and getting chicken and wild rice soup at the little Crepe Myrtle Cafe in the back. There is a zebra skin rug in that place that I can attest has been in the same spot since 1997. So, yeah, lots of memories attached to this building and this sign. I’m so glad I got this shot. 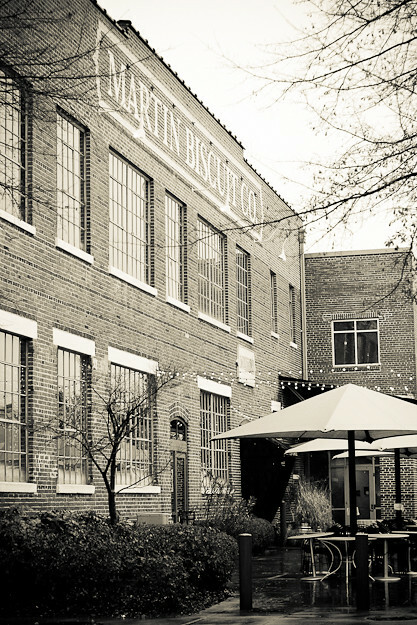 Right behind the building with the Dr. Pepper sign is the Martin Biscuit Company building. It was remodeled a few years back so I don’t have as many memories here, but I do love me a biscuit so I had to get this shot, too. 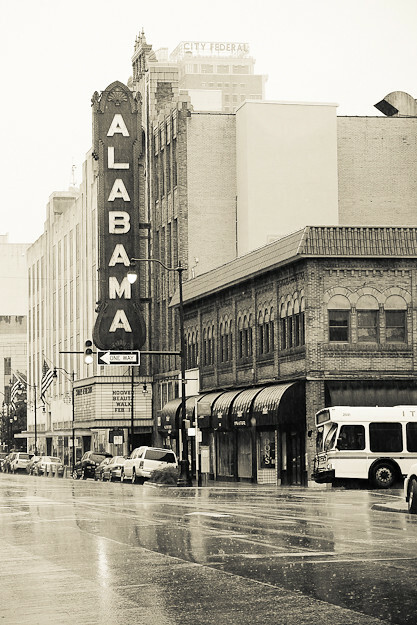 Another photo on my “must take” list was the landmark sign outside the Alabama Theatre. Click here if you’d like to download the image for FREE for your own home! To explain why I wanted this shot might take a minute. Ready for a history lesson? Ok, here we go. The Alabama Theater opened in 1922 in downtown Birmingham, where it was meant to be “biggest, best, most beautiful and most elegant movie palace in the South“. And it was, for many years. But in the early 1970’s downtown Birmingham became a ghost town. Lots of businesses and retail stores moved out of downtown to the suburbs, taking movie-goers with them. The Alabama Theater closed it’s doors in 1981. But, with the help of some really determined business people and a man named Cecil Whitmire who was a long-time organ player of The Mighty Wurlitzer organ at the Theatre, the Alabama changed ownership and was revitalized in 1987. According to this website, during one of it’s biggest weekends after reopening The Alabama grossed $20,000 in profits for a showing of Gone With The Wind. In 1987 I was nine years old, and I was there that weekend. My dad insisted that we go see that classic movie in that classic theater as it was rising from the ashes. I’m so grateful to my parents for taking me to be a part of that. I remember that I was wearing a white turtleneck with a little purple and gold pattern on it, with a purple skirt and white tights. We sat in the balcony and I was in complete awe of the inside of that place. It was just stunning. The red velvet chairs and red draperies and The Mighty Wurlitzer organ…. They don’t call it the Showplace of the South for nothing. Over the years I have attended plenty of other events at the Alabama Theater, and I can remember each of them vividly. But, none of those made such an impression on me as that very first time I sat between my parents in the balcony and watched Scarlett and Rhett and Ashley and Melanie and Mammy on the big screen. 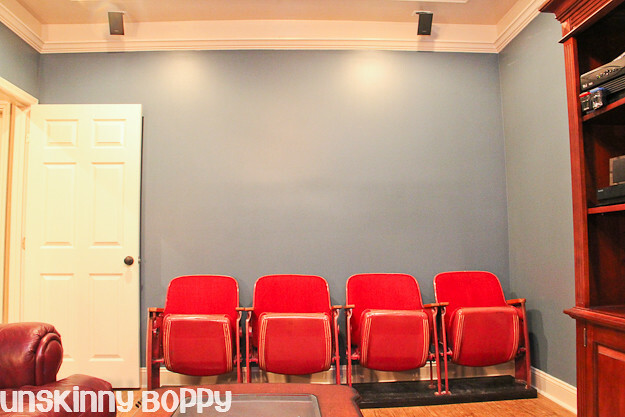 In our newly remodeled basement we have these theater chairs that J found that were once used inside the Alabama Theater. How cool is that? The chairs are so comfortable, and I absolutely love the fact that they are Alabama theater chairs. According to Google the theater was remodeled in both 1973 and 1998, so I’m not really sure during which seat renovation these chairs were purchased from the theater. One of the members of a local Greek organization got first dibs on the seats, so they bought them for use in their private club. 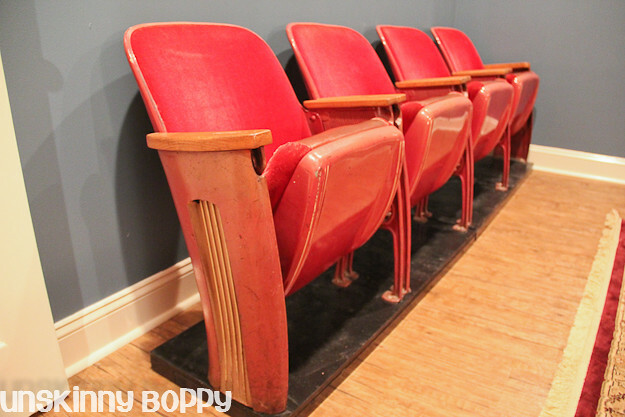 When they recently decided to upgrade their seating they listed these beauties on Craigslist and J was able to snag two sets for the basement. I’m thankful that my husband watches Craigslist for deals and fate brought these home to us. I love owning a piece of Birmingham history. Let’s just hope the Greek guys weren’t pulling J’s leg when he advertised these on the internet. LOL For all we know these might have come from the dollar movies over in Center Point. You never know. For the condition the chairs are in, the retro style on the chair bottoms and endcaps, the weight (HEAVY) and the color of the paint/ upholstery, I’m going to assume they were telling us the truth and these did in fact come out of the Alabama. See that big empty wall behind ’em? That’s where the pictures that I took are going to come into play. I want to have the downtown pictures enlarged and printed for the bare walls. Hopefully I can pull all that together soon and make it look right. While we’re in the basement, let me show you guys the rest of the progress that’s been made since the remodel was completed. I’ve got a lot of empty walls to fill up! Maybe I should go take more photographs. We’re using the old burgundy leather couches to save some cash for now. 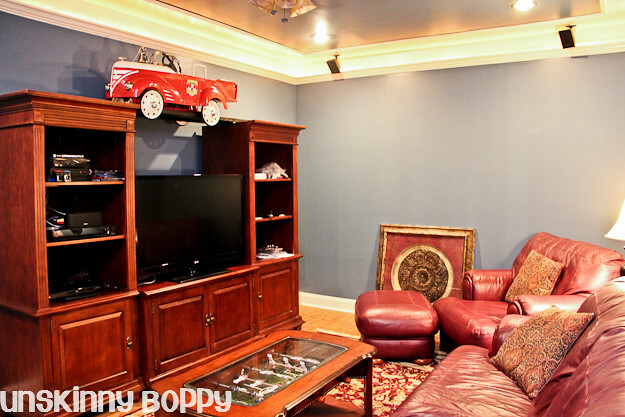 I had envisioned a big sectional wrapping around the walls, but it’s just not in the cards right now. The leather ones are big and cushy and perfect for lounging, so they are being put to good use. 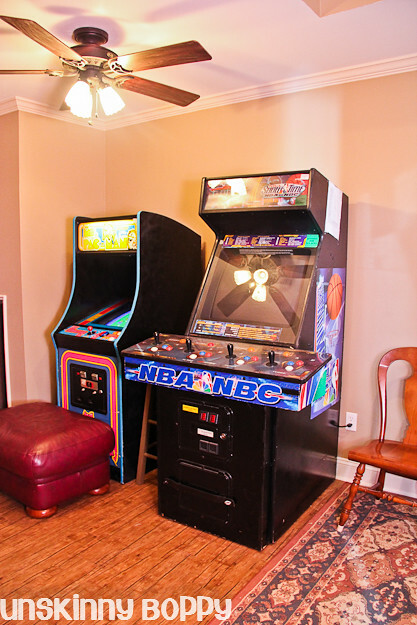 The entertainment center was one that was purchased from the previous owners of the house. 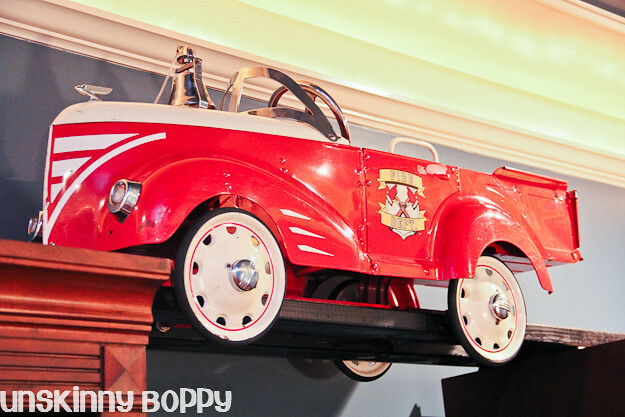 It does have a middle section, but J’s new TV wouldn’t fit inside so instead he stuck this vintage pedal car up there on the top to bridge the gap. He’s going for a retro vibe so it definitely fits the bill there. 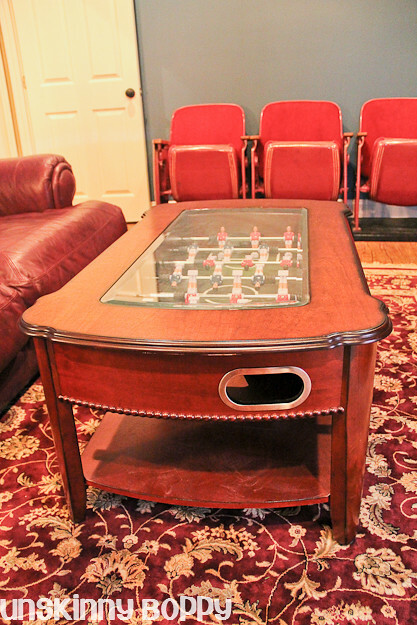 If anyone is up for some foozball action you can get your game on right there on the coffee table. Convenient, no? Out in the other room the vintage Coke machine is waiting for some refrigerator repairs before it’s in usable condition. Looks good though! 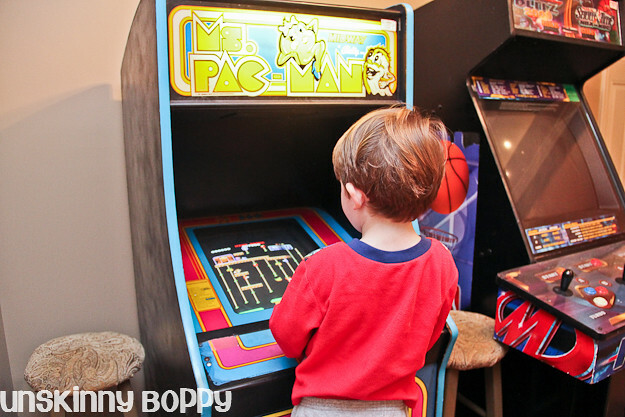 But the Ms. Pacman machine is getting LOTS of use! Lots and lots. It’s been a hit at every party. Every single person who see it wants to play it. Young or old, it’s popular with every crowd. 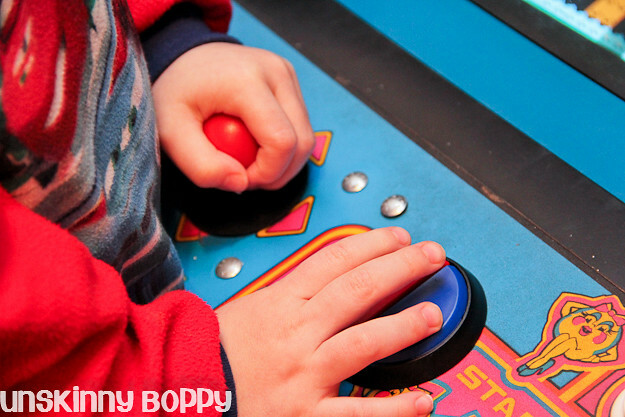 We’re working on that hand/eye coordination early. He loves playing Donkey Kong and Frogger the most. You’re not going to want to miss the unique way I framed these photos in the basement, so head on over to the future post to see how I framed these photos without any matboard. 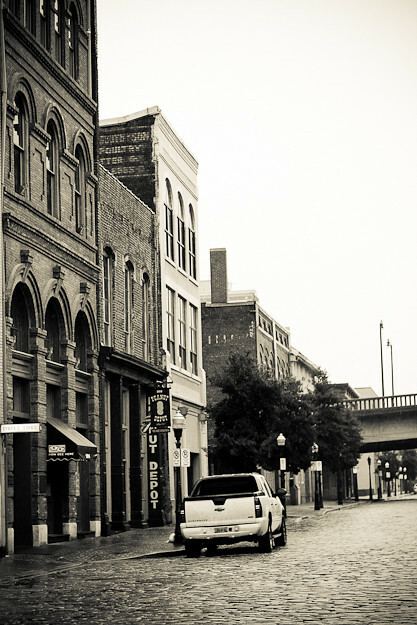 Click here if you’d like to download the pictures of downtown Birmingham for FREE for your own home! Looks great! Have you considered the photo wallpaper? Your downtown pics would look amazing blown up for wallpaper. 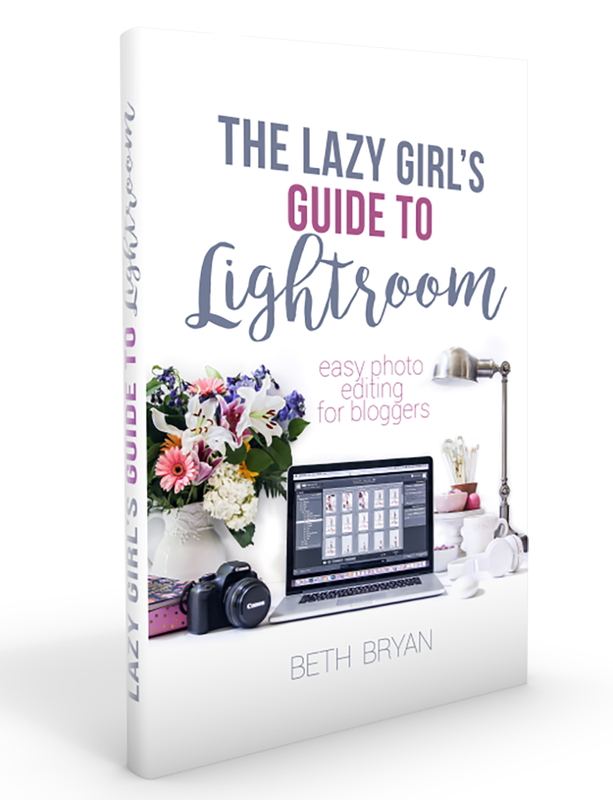 Just recently started following your blog and I had no idea you were in the B’ham area. I am too! 🙂 I love your pics! I have several hanging in my guest bedroom. The City Federal Building and Vulcan are a couple of my favorites. Wow ! Amazing room. B’ham looks so cool. I LOVE the rainy photos!! Fabulous!! And the chairs are pretty awesome, too. old theaters are fabulous! i understand how you felt sitting there, soaking in all the glamour. 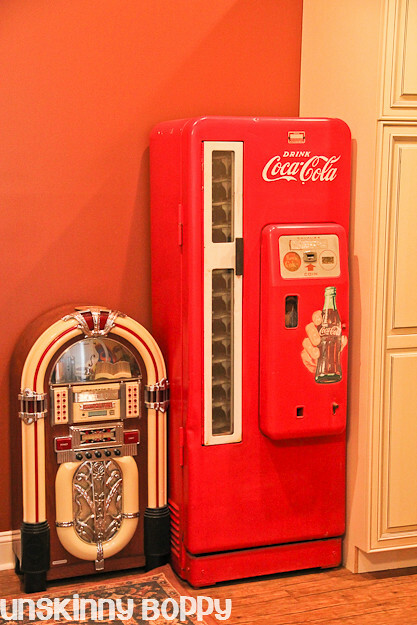 it is so wonderful that you have a piece of history right there in your home. LOVE the basement!!!!!! That is one cool coffee table, never seen one of those! How can i trade my interior design services for construction work in my basement?